…the mice will play. Since taking down my bird feeders last week after the finch disease Trichomonosis was spotted in my garden, bird numbers of visiting birds are dropping rapidly. I expected that. However, being a mostly nocturnal animal I did not expect to see how comfortable the little wood mouse below has been out in the open now. As you can see it still hides in the rock spaces around my small rocky pond. When I put in this pond, I deliberately built hidden pockets for toads and frogs with the rocks. I also hoped a wren would build a nest in this area as it is spotted there too. Alas no. I’ve another plan for that idea now. 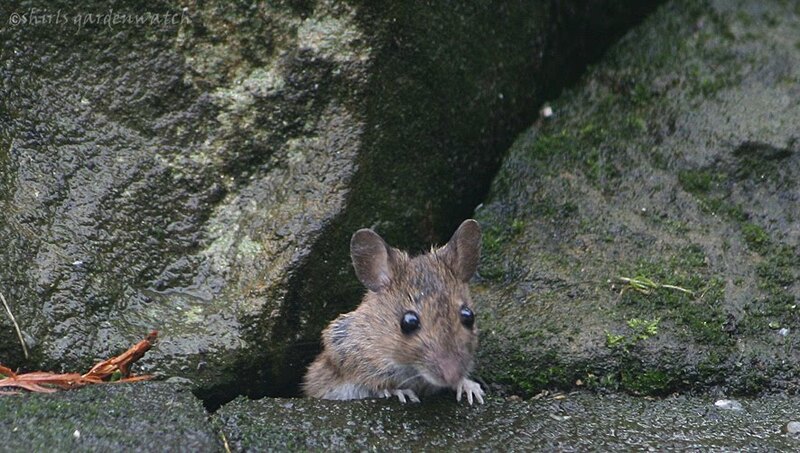 Although a little blurred in the next photo (as the mouse was moving) I loved the way it pulled itself up from the rock pocket. If this mouse was moving fast it would have been very blurred. So you can see that it was in no hurry. The wood mouse appeared to be finding little bits of food left on the ground. I had scattered some roasted chopped hazelnuts on the ground around the rocks pre trichomonosis after finding them in a store cupboard during a tidy-up. I guess it was finding them. Looking up a wildlife book on my shelf I see that feeding signs to look for with a wood mouse can be fir cones with scales gnawed off (neatly) and hazelnuts with teeth marks around the outside of a hole. Well then, my tiny offerings must have been wood mouse heaven! Regular readers will have seen recent video of a wood mouse carrying away mealworms and storing them under our hedgehog house. I also had footage of the daddy-long-legs taking the mealworms in that posting too. Now that was spooky to see. On many other occasions, I have also seen wood mice run away with sunflower hearts at night and during the day. During the day they have once again been taken in to the tunnels around my rock pool pond. At night too. What was interesting about the behaviour of the wood mouse the other day was that, without the birds running round this area, it ate al fresco. It was quite relaxed about it too. Watching it, especially with no birds about, I considered that a cat might fancy an al fresco meal too! If it did, thankfully I never saw it. Referring back my Pocket Wildlife book this morning I see that a wood mouse (being a forager of woodland floors) is an opportunist. I would definitely agree with that. When in season, its diet includes seeds, nuts, fruits and fungi. Now, I wondered who might be eating from my small garden clump of fungi. Interestingly, a wood mouse will also feed on insects and invertebrates. I didn’t know that either. You might guess now what I am planning next. Yes, you guessed right! I’m going to move my outside cam to view the fungi clump at night. I may see nothing but I’m seeing nothing outside the hedgehog house anyway… I might get some spooky viewing! 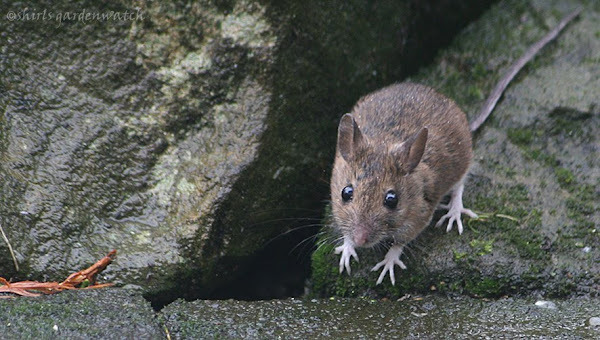 The photos of the wood mouse today had been planned as a Wordless posting on a Wednesday. Other bloggers take part with this. Alas, some chatting elsewhere kept me from doing this. I’ll come back to that another time. I’m all chatted out for the moment... well, almost! Spookily, at the moment, when I look out my window gardenwatching I feel it is the garden visitors that are watching me! The Blackbirds almost stare back straight at me. 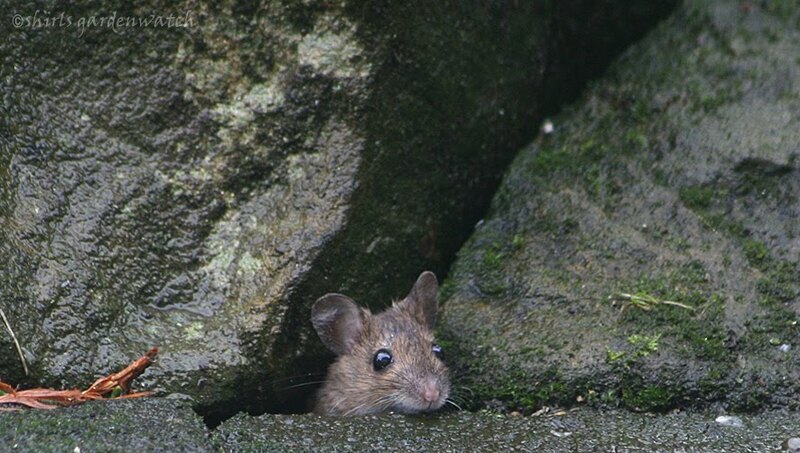 Thank goodness they don't have the deep beady eyes of the wood mouse. Wishing you a great wildlife watching and gardening weekend if you can. Enjoy Halloween too. We have a Halloween Birthday in our household. This year, it's one of those big ones for our eldest daughter… she is about to leave her teens!! Now, that’s spooky for her. Mm... until now, I never considered that’s even more spooky for us!! The photos of the wood mouse shown above were taken in my garden on October 26th 2010. Your little wood mouse is adorable. I hope he doesn't come inside for the winter. I know there are mice around my garden too but they never pose. I see them scurrying around or they venture into our garage. UGH. I hope you have a great weekend too. Oh, what a face! I have never seen such a cute mouse! Lisa is right - it is adorable!!! I need to show it to my boys. Thank you for the info, too! Have a great party! Oh dear, I'm all behind again :( I read your post on the dreaded disease on the day you posted it but was short of time so intended to come back to comment but somehow you got away from me! It is a horrible disease, I saw signs of it here two years ago and it is very distressing to witness. I do hope that in time they may become immune to it. It was interesting too to read of what is happening in your garden at the moment plant wise. I was pleased to see your perennial wallflower is still doing well, that is one plant I did get round to putting in my garden this year, it will be interesting to see if it lasts any longer than the last one. We have what are called field mice. It may be the same...sure don't hang around long enough to take a picture. What I meant to add to my post was I watched this mouse run around under plants looking like it was collecting material. I never saw exactly where it took it but it didn’t leave the pond area. Hopefully it was redecorating a pond cave for winter and it will have no need to come inside the house. UGH… indeed. I hate to think any make it into our garage. In our previous old shed (with rotten bits) mice made it in there. I store my bird food there and it made a cosy home in a jar with a variety of material in it. Needless to say I went… UGH. Hello again Tatyana, quite a picture! Thanks, looking forward to seeing my daughter home for the weekend. She’s looking forward to coming home too and the Party is just the icing on the cake… oh… better get that made too! Hi Carol, yes very cute. Although, I feel these really dark beady eyes perhaps hide a sinister side. I wonder why they need to be so big on such a small face. I guess it’s something to do with having good sight in the dark. Thanks, it was fun trying to capture the character of this little mouse with my camera. Thank-you, my daughter will appreciate your birthday wishes. Lol… she’s always had a spooky birthday. I’ve had great fun decorating the house over the years. Got fancy balloons for this year… they have tiny LED’s in them. In a purple shade, a large group will be the spooky lighting for the room. Looking forward to see them. Yes, field mice are similar I think. Usually our wood mice don’t hang around much either. This was unusual to see one, not being nervous, out in the open during the day. Thanks, I had fun trying to get my photos. I watched this mouse for a while. Incredible photos. I love the wee splayed feet on the last photo. I imagine you just like a photographer on the plains of East Africa, holding still, breath held for the perfect shot. But you are in your garden, and this delightful mouse is just as amazing as any wilderbeast. Brilliant photos of the Wood Mouse Shirl. It will be interesting to see what it get up to when you move the camera. Lovely pictures. I like the ears on woodmice - so big and twitchy. It is obviously enjoying the extra peace and quiet in the garden without the birds. Must be mouse paradise! He is a cute little guy but all too often these little creatures find their way into my home and leave their 'presents' around the cupboard. If they would just stay outside....sigh. Happy birthday to your oldest. The little white feet have my attention. Have found many little critters here in our garden in Nova Scotia, but do not recall any mice with the tiny white pitter patters yours have. Happy B'day to your oldest! What a cute little face. They like to get into and under houses around here so they aren't as welcome. As long as they stay outside I don't mind them. Hello John, thanks. This particular mouse was quite photogenic and easy to catch staying still. I was fun to watch though. I kept wondering how much bolder it would become. Well, this new night camera position has been very interesting. At the moment I have it a bit too close to the fungi so it is pretty white with the IR. 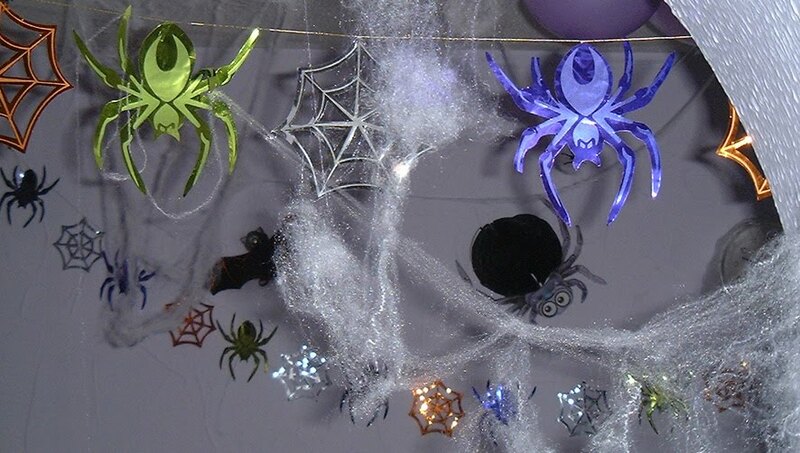 Lol… paper and plastic spiders crawl all around my house at the moment. Very quickly my fresh dusting was replaced by an elaborate network of newly manufactured cobwebs… really spooky. With low lighting you can hardly see them but… put your hand out and touch something…. Hi again Denise, thank-you… me too although I am very drawn to the beady eyes. I’m surprised how delicate looking its nose is too. Without taking photos I would never had noticed this. Hi Layanee, yes I do hear you. Thankfully not a problem I have spotted here (yet). I can imagine just slightly what that must be like after having them in my old shed. It gave me the shivers there just to see a nest in a jar. Presents in your cupboards though… yuck, yuck, shiver, shiver, yuck! Yes, outside homes are best. Hello Brenda, yes I have to say the feet caught my eye when I cropped my photos. I didn’t realise they were quite so delicate… and clean! (Blush) Really pleased I may have started it too. REALLY, REALLY BIG SMILE!!! I guess that is main difference between our mice… opportunities to get into houses. In the US you have basements and your houses are way much larger than the average house here in the UK. I just have to make sure I keep my back door (near my pond) shut which it is usually anyway. No net screens or wood to chew either with it being PVC and double glazed. My garage at the front is another matter though as the up/over door has small gaps around the hinge. It is also kept closed so that must help a little. Never seen mice there (yet). Thanks, for your birthday wishes. I’m guessing your oldest being 20 seems a long way away. I hope she is still enjoying her new school.